Don't worry, this isn't one of those click-bait articles with a misleading headline. It really is video of a guy riding a motorcycle on a notorious wooden roller coaster track. With a few back flips thrown in for good measure. Because, hey, why not ride a motorcycle on a roller coaster? 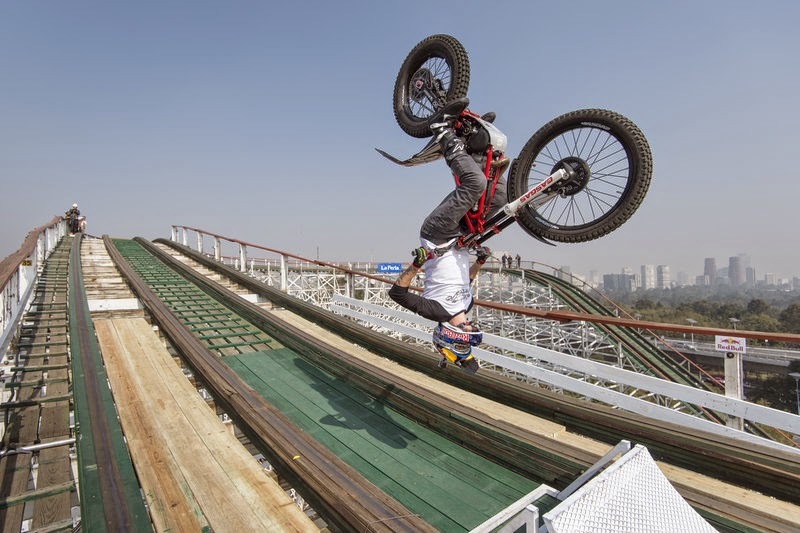 The motorcyclist in question is trials legend Julien Dupont; the roller coaster is the Montaña Rusa in Mexico City -- a 50-year-old wooden beast that once held the record as the world's tallest. Put the two together and you have the potential for all kinds of terrible mishap. Which is part of the fun of watching, of course. And as if the threat of plummeting 110 feet wasn't enough, Julien also throws in a few backflips. It's impressive stuff, to be sure, but we'd like to see him take it to the next level and attempt this on a Harley-Davidson Road King.